Well it is about time I got back to writing about the tasty food in our market! Like always I was taking a stroll through the market when a spotted a jar that had lost its label. Since it was in its proper spot it was easy to tell that the poor naked jar was one of our Hungarian products from BENDE, Stuffed Yellow Peppers. I looked to see if I could find where the label had fallen to see if there was any way to fix it, but alas it was long gone. Since we can’t sell an item without a label I decided that fate had intervened and it was to be my newest subject. As always, when I have an item that I don’t have any experience with I start asking around (it is so handy that I work around so many chefs). I went first to Chef Garyn, who is a 3rd generation Hungarian American, to see if this was something he was familiar with. He said that he had seen it used with food that was similar to Antipasto; the other Chefs agreed that the best way for me to sample this was with salami. Up front Chef Josh gave me a small handful of our Cittero salami slices & cut up the end piece for me to use. 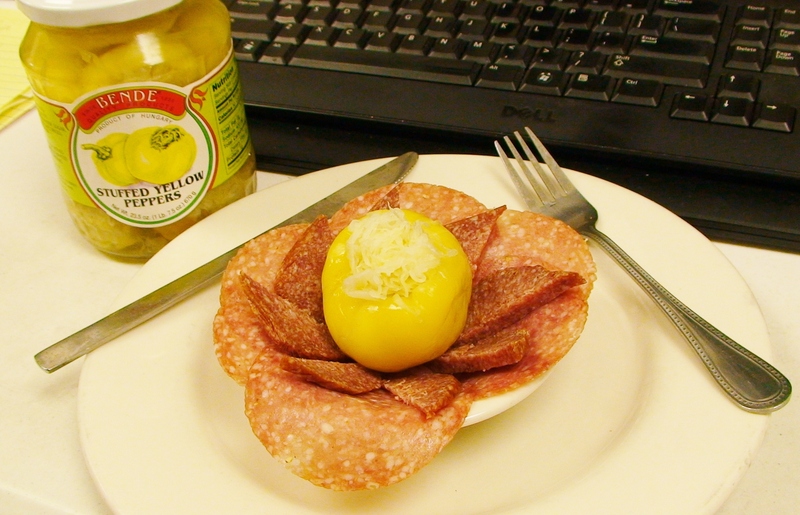 Back at my desk I laid out the salami pieces and popped open the jar. “WHOA! !” was the exact reaction to the smell that hit me in the face. The smell of yellow pepper was so overwhelming that it took me completely by surprise. I love hot & spicy things but even I was concerned that I may end up regretting this one. I forked out all 7 of the peppers and added them to the plate to take pictures, the smell was quick to abate and I began to feel more at ease while I took photographs. Finally I took a deep breath and began. Now I’m not real orthodox when it comes to how I sample everything, I took a big slice of salami curled it around the bottom of the pepper making a salami and stuffed pepper taco and took a bite. I was relieved that the pepper was not as hot as I had been working it up in my mind. The pepper flavor & heat are what I tasted first, followed briefly by a subtle taste of vinegar before the pepper came back with more of a light burn while I savored the crunch of the cabbage and meaty taste of the salami. With the following peppers I tried different ways to dress them up for presentation (maybe I was playing with my food a little). 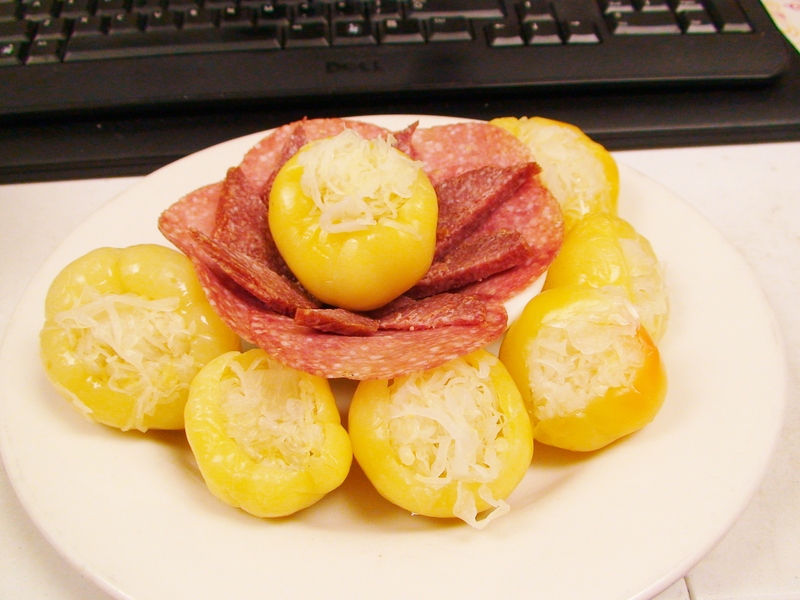 I stuffed salami wedges in the sides, it was not a pretty look and when I ate that one I felt like I was just eating a plain stuffed yellow pepper, and it hid the flavor and texture of the salami and made me realize that the salami slice actually helps offset the hotness of the pepper. The best way I found was simply to cut the pepper in half and wrap it into a salami roll. I was only able to coerce two of my coworkers into giving them a try and they each had different reactions to how hot the peppers were. The one agreed with me that it was just within the threshold for being really spicy but still enjoyable enough that neither of us felt a need to go scrambling for a glass of milk. Our other coworker felt it was really spicy and said her mouth was on fire. I believe that if this was cut up used in an antipasto salad with some pasta & chunks of salami and served cold it would be a big hit at a summer gathering. Today I wanted to try one of several jarred items that always seem to catch my eye and draw me in. We have a few BENDE products and they all look very appetizing, for today I chose the Hot Mixed Salad. Looking at it through the glass I am imagining it will taste like a spicy cole slaw. Theo described this to me as being the Hungarian version of Kimchi. 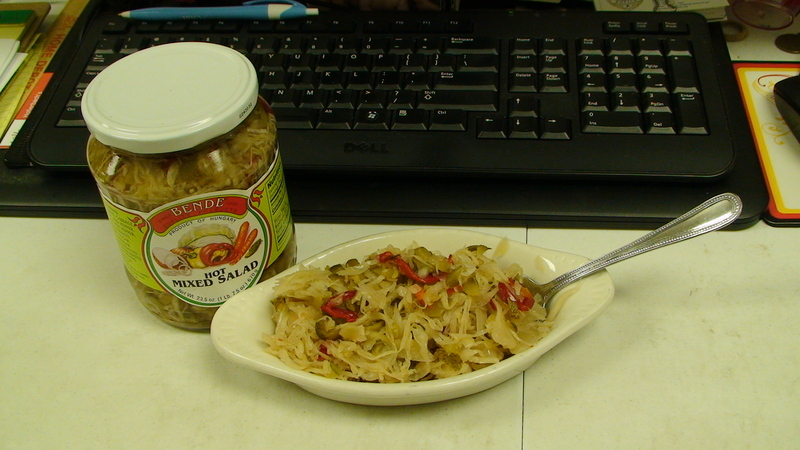 Popping the jar open at my desk I was pleasantly overwhelmed by the aroma of vinegar & sweet pickles. Spooning out the contents for pictures I noticed that the cuts and slices of pickles, cabbage, onions, peppers and green tomatoes were not evenly cut…a strange thing to notice but I’ve worked in the kitchen and know the difference between veggies that were cut by hand & the ones that were put through a slicer or processor. The overall look was that of a handmade salad. The first bite was a small adventure, with a light taste of vinegar, followed by flavors of pickle, and then the heat. I enjoy spicy foods so for me the fire was a bit of a surprise but not overwhelming. The texture was just as I had expected, similar to cole slaw. The heat stayed with me for several minutes afterwards making my mouth all tingly. Sydney was walking by and was curious enough to try a bite. We brainstormed for a minute about how it would taste great as a sandwich. I handed over the jar and she disappeared into the kitchen to see just what would be great with a mixed salad. Upon her return a few moments later she described what she had done. 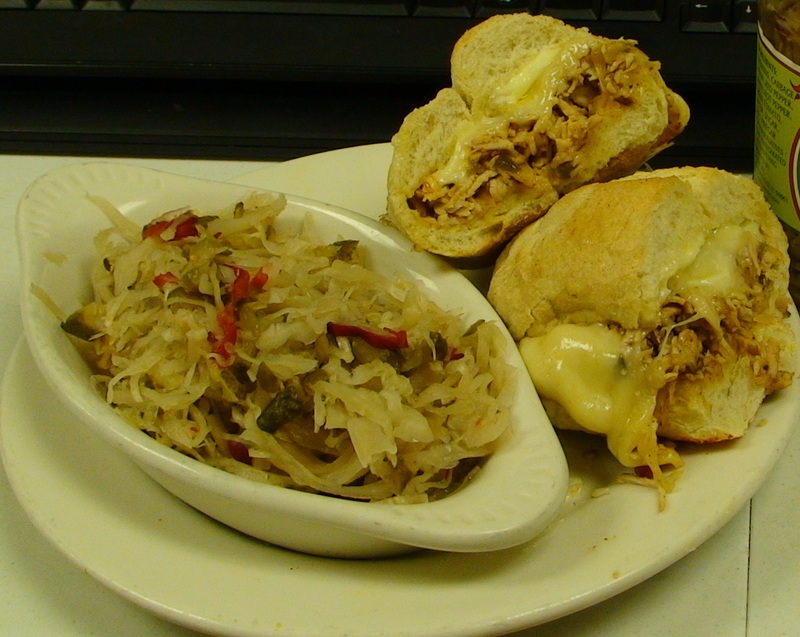 Using one of our fresh brotchen as a bun she melted a slice of Munster cheese over some Ziguener Turkey. A light spread of mayo on the bun and a spoon full of the heated hot mixed salad. Sydney said that it gave the meat a nice sweet flavor when cooked but the spicy bite was milder afterwards. I packed more of the salad on to my half, making the sandwich a fun mix of hot and cold. The gooey melted Munster was fantastic with the crunch of the cool mixed salad. All together it tamped down the spiciness from a pronounced taste to a more of an accenting flavor. Overall it is delicious; I ended up finishing the remainder. I’m now looking forward to the next few hours to enjoy the left over heat that I can still taste. Corned Beef & Cabbage? YES PLEASE! Ok ok ok so maybe “Ireland Forever!” is not the best thing to shout out in a German deli, but it sure made me smile and really gets me excited for St. Patrick’s Day. What has become a tradition in my house is the Willow Tree’s special Corned Beef and Cabbage. Usually during the one week its available my husband and I will have one plate a day…for seven days. By the last day we are so full of it we are only too happy wait until next year. The corned beef is so tender and juicy, with the most delicious briny taste. The red potatoes are always done just right, and served next to our freshly braised cabbage, onions & our favorite Applewood Smoked Bacon. Together they fill the plate, covering it in a hearty mound of joy. Served on the side is our special Dijon Mustard Egg Sauce, I usually order an extra because it is just SO GOOD to dip the potatoes and drizzle over the corned beef and cabbage. Because we’ve had so many requests it has been decided that while we can, we will offer the steamship round corned beef at Magnolia Square Market! 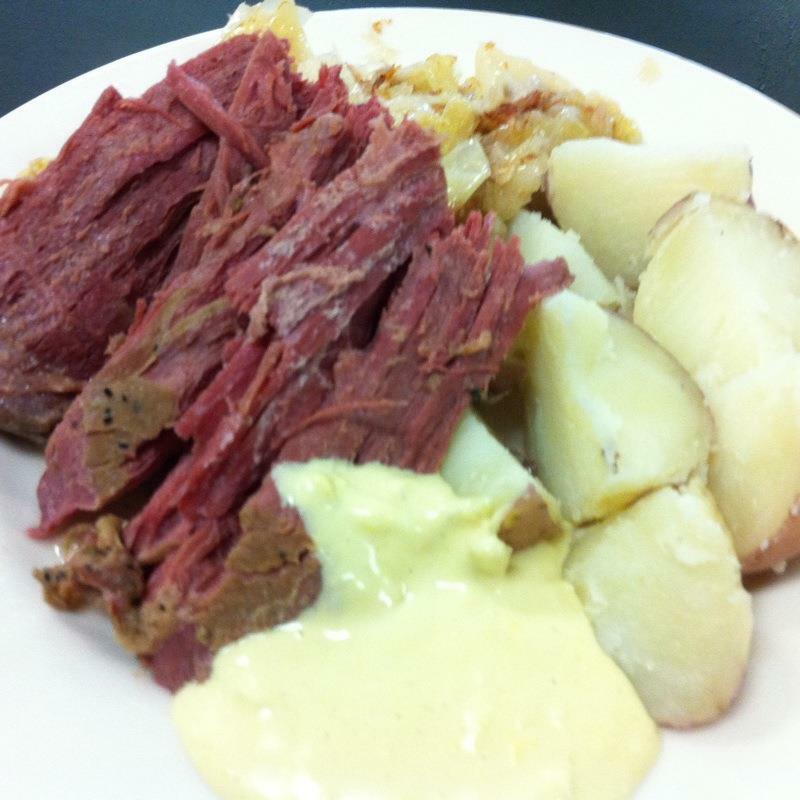 So now I can enjoy a full plate for lunch and take home some corned beef for a nice Irish style home cooked dinner. Hmmm I’m thinking a side of colcannon and some hot cross buns…is it dinner time yet?